Wash chicken breast under cold water and boil with 2 cups of water. Then chop the boiled chicken breast in bite sizes and leave the chicken stock to use later. Cook the macaroni 2-3 minutes less than the minutes given by the directions on the package for an al dante texture. Drain the macaroni and transfer into a wide Pyrex. Mix with chopped chicken. Meanwhile in a pot, cook milk and cream of chicken soup. Simmer until the mixture thickens. Adjust the thickness by adding water. Stir in beaten egg and black pepper. Then pour the mixture over the macaroni and mix them all. Spread shredded mozzarella/cheddar over. Preheat the oven to 400F (200 C) and bake for about 20-30 minutes till the surface turns light golden brown. 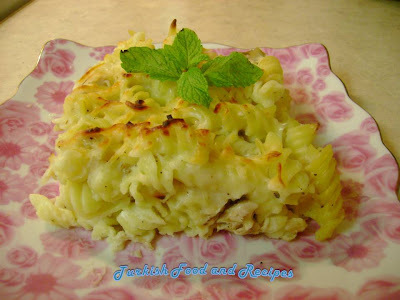 Serve Chicken Macaroni in the Oven warm. Tavuk gosgusunu yikayin ve 2 su bardagi su ile haslayin. Sonra pismis tavuk gogsunu kucuk lokmalar halinda dograyin. Suyunu corbayi pisirimek icin ayirin. Makarnayi paketin uzerindeki talimatlara gore haslayin, fakat biraz diri kalmasi icin 2-3 dakika daha az pisirin. Sonra makarnanin suyunu suzup genis bir borcam tepsiye aktarin. Dogranmis tavugu ilave edip, harmanlayin. Bu arada bir bardak sut ve tavugu hasladiginiz su ile kremali tavuk corbasini pisirin. Atesten almadan once yumurtayi ve karabiberi ilave edin ve karistirin. Koyu kivamli bir karisim elde edeceksiniz. Eger kutu/konserve tavuk corbasi kullaniyorsaniz ve koyu kivam olusmadiysa, bir tatli kasigi nisasta ilave edip kivamini ayarlayabilirsiniz. Bu karisimi makarnanin uzerine dokun ve esit olarak dagitmak icin karistirin. Uzerine kasar peyniri serpin. Onceden isitilmis 200 C (400 F) firinda uzeri kizarana dek pisirin (20-30 dakika). Firinda Tavuklu Makarnayi sicak olarak servis yapin.